A new brochure, Trap Safety for Pet Owners (PDF 478 kB), produced by the Alaska Department of Fish and Game and the Alaska Trappers Association, illustrates how to remove pets from traps and snares. Visit your local ADF&G office if you would like a paper copy of this brochure. ADFG has also developed a series of short videos on how to release pets from specific kinds of traps. No one wants to see a dog caught in a trap intended for a marten or a wolf, but it occasionally happens. Many of Alaska’s communities are adjacent to prime wildlife habitat. Trappers are drawn to these areas, as are dog walkers, snowmachine riders and hikers. Some residents close to these areas allow dogs to roam free, and pets sometimes wind up in traps. The Alaska Trappers Association has produced a 30-minute video, "Sharing Alaska's Trails," to address this issue. "We want to be proactive and constructive about this," said Steve Davila, past president of the ATA. "This is part of our effort to eliminate or reduce the risk of pets getting caught, and conflicts on traplines." Long-time Fairbanks trapper Pete Buist is the narrator on the video. Buist, a hunting guide and former state game board member, is also a former president of the ATA. Buist has trapped for 40 years, and for 20 years he used a dog team to tend his trap line. The video doesn’t show dogs caught in traps, or feature any footage that pet lovers might consider disturbing. It doesn’t promote trapping, but deals with the practicalities of sharing the trails. "The content was largely dictated by some of the comments we’ve heard over the years from people who have had dogs and cats caught," Davila said. 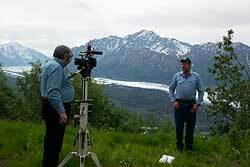 Pete Buist, narrator of the new video "Sharing Alaska's Trails," during the taping. Photo by Keith Bayha. The video highlights signs that a dog walker might see if he or she was near a trap line, such as a bird wing fluttering from a pole, survey tape or flagging and piles of bait. Trappers sometimes post notices alerting others to the presence of their line. "Sharing Alaska’s Trails" also features Buist going over different types of traps and snares and how to release dogs from those traps. He also offers suggestions for subduing and handling dogs in traps. "He demonstrates how to open them up, how the locks function on snares, diagrams of traps and what a set might look like," Davila said. A ‘set’ refers to a set trap. "It’s primarily directed at folks with dogs, but we talk about shared trail use and other issues," said ATA vice president Randy Zarnke. Zarnke said trappers targeting wolves will sometimes cut a trail and set wolf traps in the trail. "If recreational snow machine riders ride down that trail, that will put the traps out of commission." "It’s good for folks who are snowmachining to recognize that they are on a trapline, as opposed to just any other trail," Davila said. The trapper's association spent about $7,000 to get the video made. A small Anchorage-based firm produced the video, Davila said. The video grew out of trapping-awareness seminars the ATA has delivered in various Alaska communities. As time progressed, it became apparent that more outreach was needed. It’s not always feasible to have a warm body in place to speak to groups in Alaska’s far-flung communities, Davila said.